Detective Casey Clarkson (pictured above) decided that there was probably no better way to spend his first overtime shift in years working a country music festival in Las Vegas in early October. He expected his night would include things like helping a stumbling drunk woman hail a cab, which he did do a little before 10 PM that night. But shortly later, a round of gun shots started off a night from hell for both Casey and his twin brother, Sgt. Branden Clarkson, as well as the rest of the Las Vegas community. The shooter was Stephen Paddock, who brought an arsenal of rifles up to his suite on the 32nd floor of the Mandalay Bay Resort and Casino. He smashed out two windows with a hammer, mounted his guns on a tripod, and opened fire on the concert crowd of over 20,000 people. When he was done, 58 people were left dead and over 500 were badly wounded. It was the worst mass shooting in U.S. history. Branden did not receive a response from Casey, but didn’t worry, knowing how chaotic and busy the scene he was working must have been. 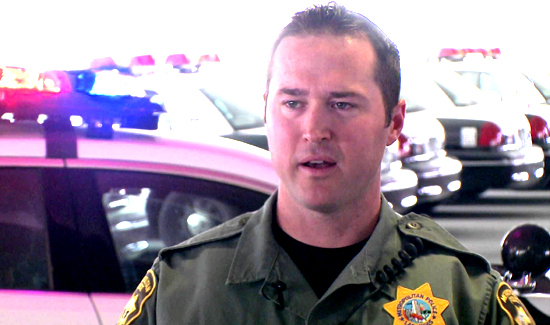 Branden went directly to the department’s command post where he helped direct officers. He was also in charge of keeping track of the locations of officers, and which ones were injured. “And I’m like, OK, cool,” he said. But his brother was not exactly OK. He then added his twin brother to his list of injured officers. Both officers gave their all that night, but their jobs couldn’t have been more different. Branden’s job was tactical and planned out—making sure everyone was where they were supposed to be. Casey, however, was working on instinct and gut, trying to get as many people as he could to safety. Working in law enforcement certainly runs in the family. The twins’ mother, Brandi Lewis, was actually the first to work for the agency, as an administrative manager. Her husband, the twins’ stepfather Branden, worked his way up the ranks and now runs the department’s crime lab. Growing up, the twins loved hearing his stories of life on the job. The brothers, who are identical and difficult to tell apart, both signed up for the academy the day they turned 21. Detective Tara Brosnahan, Casey’s partner, was the first to call in shots fired the night of the shooting. As soon as they heard the first shot ring out, they got to work saving lives. It was shortly after everything started that Brosnahan noticed that Casey’s neck was bleeding. Likely because of the adrenaline, he felt nothing. He continued helping concert goers escape the gunfire, pushing them through fences five at a time. Eventually, his partner used her fingers to put pressure on the wound, taking him to the medical tent where he would, luckily, find out he wasn’t bleeding profusely. They finally headed to the hospital, taking several other wounded people with them. The injury ended up being about the size of a nickel and it was sewn up with stitches. Despite the worry Branden had about his brother, he never left the command post because he knew Casey was in good hands. He wanted to focus on his job and make sure other people could end up safe. After Casey was released, he headed right for the command post, where and his brother embraced, grateful they were both alive and well. After a moment of emotion, duty called. “I’m glad you’re OK, but we’re really busy. I’m going to need you to check in with the staging area because you’ve got to get redeployed,” Branden said to his twin. And off they went.